This photo, likely taken at Reagan's Washington, DC home, "Westwood" in late October 1980, just prior to the general election that propelled Reagan into the White House. John Homeier (right), a successful central Illinois businessman, is seen in the photo shaking hands with the future President. The inscription beneath the photo says, "To John. Thanks for your support! Best Regards, Ronald Reagan." The photo is one of a triad of artifacts, all matted and framed together. The other two objects are, 1) a telegram requesting Mr. Homeier's presence at the Reagan's in Washington, DC, and 2) a letter sent to Mr. Homeier from President-Elect Reagan thanking him for his attendance at the meeting. 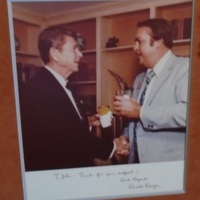 “Homeier - Reagan Photograph,” UIS History Harvest, accessed April 18, 2019, http://uishistharv1.uis.edu/items/show/249.